Formerly a Congregational chapel built in 1865, it has been restored to retain its original features mixed with contemporary interior design and a mix of traditional and contemporary furniture. The property is located in the village of Carew Newton and is within easy walking distance from Carew Castle, Tidal Mill and of course Carew Inn. The interior incorporates natural slate floors and hardwood floor on the ground floor, with carpeted bedrooms. All the bedrooms have en-suite bathrooms, one with a large modern free-standing bath. The Chapel interior features 19 foot high ceilings together with a internal balcony area. A cast iron wood burner is the central feature of the lounge area and adds to the overall atmosphere of the interior. There is a large kitchen area which was originally the Vestry and features large glazed doors opening out onto a large decking area, small garden with lovely views over the surrounding countryside. I have worked within the commercial interiors industry for the past 25 years and I've always been interested in the restoration of buildings. Restoring The Chapel was a wonderful experience as the building was falling into disrepair. I was born in Pembrokeshire and even though I now live in the South East my heart belongs to West Wales. My old school friend Anthony introduced me to the building one day on the way back from being at Barrafundle beach. I immediately fell in love with the place and the hamlet of Carew Newton being located so close to Carew Castle and the Cleddau Estuary. The Chapel is beautifully situated overlooking the countryside around Carew. Logs are provided for the wood burner. Duvets and bed linen are provided. Prices are inclusive of electricity and oil central heating. The Chapel was big enough for the 5 of us (2 adults and 3 children 9,6,2). Location Is great :near Tenby, near Carew Castle, Not far from the Green Bridge of Wales. We really appreciated the quietness of the Chapel. We would love to come back! Wow! If you like staying somewhere out of the ordinary then this property is for you! We ( A family of 6 adults) had a fabulous holiday visiting the many beaches and attractions nearby then were able to relax in the peace and quiet of the countryside. Having a pub within walking distance that serves good food was a bonus but this is the first house I have stayed in that had large enough cooking pots to cater for 6 hungry people. The weather was gorgeous and you can just glimpse a tower of Carew Castle from the Chapel garden. Bear in mind for your stay that there is only a small fridge with an ice box and as it was so hot this year it would have been perfect if there had been an additional small drinks fridge available for the many cans and bottles 6 adults get through in a week! This house is very stylish, comfortable and well appointed and we will definitely stay here next time we holiday in Pembrokeshire. We all loved the Chapel, Serendipity finding it and that it was available for us to book this summer. Thanks for the kind message and I'm really pleased you enjoyed your stay. A few people have mentioned the fridge so I will be adding an additional fridge. We (family of four children's ages 9 and 7) had a great week long stay at The Chapel. I would recommend people visiting South Wales to stay here as it is very quiet, walk-able to the pub and to Carew Castle. It is only a short drive to Tenby and Saundersfoot, Amroth and Pendine. Folly Farm was great, we stayed all day, the Blue Lagoon was okay, the children loved it. The Chapel is well equipped, and is set in beautiful surroundings. We will be back! Thank you Peter, we had a great holiday. Stayed here 18-25 sept with our two grown up daughters & boyfriends. Great modern space to stay in and beautiful tranquil location,good size kitchen, would have benefitted from a freezer,great dining area,lounge good size and lovely log burner, very clean. Negatives however were lack of crockery, sofa's in lounge not adequate to seat 6 adults at once, but as we spent our evenings playing card/games as a family in the evening it did not impact too much, however the downstairs bedroom had a pervasive smell of damp as there was a leak in the ensuite ceiling from an upstairs bathroom, overall the inside was tired and in need of a touch up which i understand the owner is due to do at the end of the season. Despite these niggles we had a lovely week and would reccomend this area to anyone with families/ couples etc.We chose this area as our children & boyfriends had plenty to do on the doorstep however be aware if you go this time of year attractions may only be open wkends or part time. We first visited 'The Chapel' in the summer of 2008 & couldn't wait to return this year in August......it was as great as we remembered! Peter was as helpful with information & advice as he was 2 years ago & the property was clean & tidy with everything we needed for our weeks holiday. Our group consisted of 3 Adults, 2 15 year old boys & a 5 year old boy, we found activities & attractions for everyone, Quad biking @ Ritec Valley, Mackrel fishing from Tenby, Dinosaur world, St Davids, Beaches including Manobier, Freshwater East & Pendine sands, crabbing in Saundersfoot, walks to Carew Castle & Mill, Bicycle rides to The Milton Arms & Cresswell Quay & of course......Our daily visits to The Carew Inn for a cold glass of refreshment(!) on our way 'home' to The Chapel! The Carew Inn also does fabulous food in the bar & restaurant & twice a week does lovely Barbecues! We will definately be back to do it all again & again & again! The Chapel is located in the quiet hamlet of Carew Newton and only 5 minutes walk from Carew Castle and Mill pond. 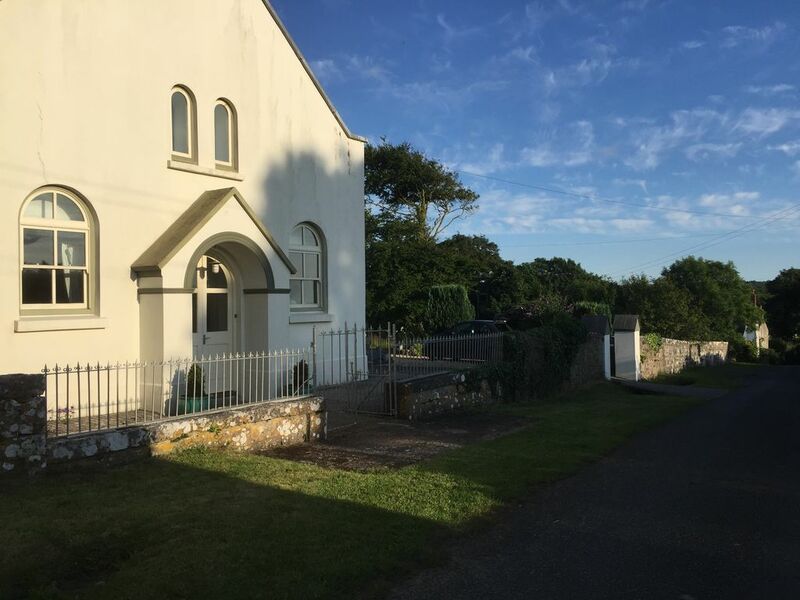 Another benefit is that it is in the heart of the Pembrokeshire National Park which means that it is surrounded by beautiful countryside and close to lots of stunning beaches including Pembrokeshire 'jewel in the crown', Tenby. In addition, Carew Newton is only 15 minutes from the ferry port of Pembroke Dock with regular sailings to Ireland. It is about an hour away from Cardiff airport. Other Activities: Rock climbing, abseiling, bird watching.